It all started with a Good Housekeeping magazine that someone had left on the table in the break room at work. Inside, there was an article about how to make yourself look seven years younger. One of the things they recommended was this salad which was supposed to promote healthy skin because of all of the healthy ingredients. What I noticed about the salad was not the promise of beautiful skin; I noticed rather that the salad was artfully arranged in layers in a mason jar. I may be one of the last people to have heard about this phenomenon, but I thought it was a great idea. I was excited because I’m always looking for ways to make lunch preparation both simple and healthy. I immediately began searching for instructions on the internet for making salads in a jar. After reading other people’s recipes, I decided to mix things up a bit and try to create some of my own salads in a jar. My first creation was a Chinese chicken salad recipe. This was followed by a taco salad recipe. (Both of these recipes will be featured on Patty Cakes Pantry over the next few days or weeks.) My creations were well received by my family as well as one of my co-workers who is always willing to try something new. In fact, she was so excited by the idea that she made twelve quart-sized salads and stuck them into her fridge. The salads she created consisted of six chef’s salads and six taco salads. The photo at the top of this post is hers. 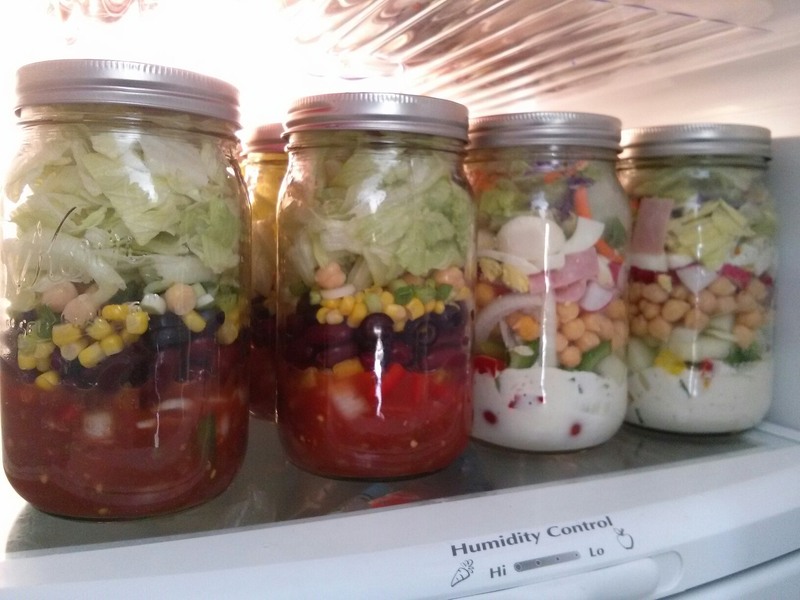 These salads were eaten, one at a time, over the next four days, and she reported that the salads she pulled from the refrigerator on day four were as fresh as the ones she ate on day one. I had read that they would stay fresh for that long, but having someone I knew and trusted confirm it for me was wonderful. Dressing goes into the bottom of the jar. The items that are added next must be able to withstand being submerged in or in contact with the dressing for extended periods of time without losing their texture. Good items for this layer are whole cherry or grape tomatoes, diced bell peppers, julienne carrots, chopped onions, cucumbers and beans. Once vegetables have been stacked beyond the point where they will be in contact with the dressing, other ingredients such as meat, cheese, hard-boiled egg, and olives can be added. You don’t want to put something toward the top that will dampen ingredients below it. For instance, the olives would probably go toward the bottom of that list. Finish off your jar with salad greens of your choice. I prefer romaine lettuce and my co-worker prefers iceberg. Both types of lettuce served us well in our jar salads. Salad in a jar is a simple, delicious and healthy way to prepare those work day lunches or to leave a ready-made lunch at home for your family. Give them a try, you’ll be glad you did.